The campaigners from Somerset and Gloucestershire have won and so the 21 threatened libraries in those counties will stay open. Where the Councils did not win was over giving sufficient regard to equalities legislation. It was found that both made decisions to close libraries without sufficient information gathering, analysis or concern for the vulnerable (for instance single mothers, elderly and the disabled). In Somerset, this means the closure of eleven libraries is “unlawful and can be challenged”. In Gloucestershire, the desire of the council to withdraw funding from ten libraries, giving libraries such as Hester’s Way (in one of the most depressed areas of the county) and Churchdown to volunteers instead, has been rebuffed. This battle is won therefore for the campaigners, and well they deserve the victory, but the war itself is not. One of the key things that will help defend matters is, crucially, the intervention of the Secretary of State in defining once and for all what a “comprehensive and efficient” library provision actually means. Sadly the uninterested Jeremy Hunt, and his silent deputy Ed Vaizey, give no indication that they are willing to do this and so this battle may just be a blip in the ongoing dismantling of the widespread local provision of libraries. For now, though, that is a problem for the future. This is the first time in British legal history that a council has lost a court case over public libraries. It has, whether Somerset or Glos, Doncaster or Dorset, Brent or Croydon like it or not, set a precedent to say that councils need to be properly think out the cuts. It has also sent the message that you don’t mess with those who care for their local libraries. Well done to all concerned. Campaigners score victory at High Court – CILIP Update. Long article. CILIP response to the Gloucestershire and Somerset libraries judicial review – CILIP. Congratulates the campaigners, that all communities and minorities need to be considered before cuts are forced through, that cuts to library services should be “proportionate” to other services and that there should be a national vision for libraries underpinned by proper standards. Councillors at the most dangerous when wounded – Alan Gibbons. [Council] “statements wilfully misinterpret what the judge said. The judge said: “the decisions under challenge were not just unlawful but bad government” hence the total quashing of the library plans and telling them they have to start again. It was VERY serious that they lost on this point. The judge said it was a “substantive error of law” and a “substantial breach”. Expect the wounded beast to bite back. Campaigners will have to be ready to fight on. They have right on their side. High Court Judge rules GCC’s library cuts unlawful – FoGL. Official statement from the Gloucestershire campaigners points out that the failure really lies at the door of the DCMS and the shamefully silent Ed Vaizey. 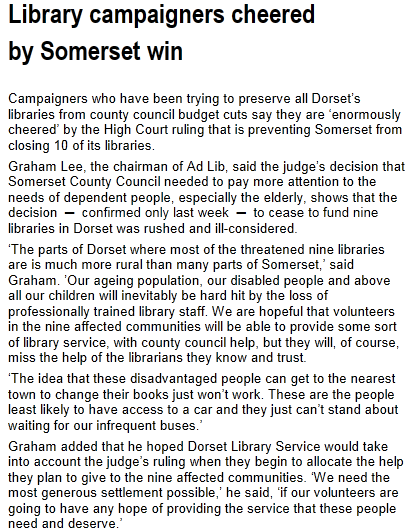 Judge rules County Council library closures “unlawful” – This is the West Country. In an interesting use of logic, the council QC asked judge not to quash decision because this would just cause “further delay” and “uncertainty” to the employees that would otherwise lose their jobs and to the locals who would lose the service. Library campaigners win legal challenge – Channel Four News. “The judge is considering what “relief” should be granted to the claimants in the light of his ruling. Lawyers hailed the decision as “a victory for campaigners whose opposition to the councils’ library cuts had been ignored”. Library closures can be challenged, judge rules – BBC. In an interesting definition of the word “comprehensive”, the Council lawyers said this did not mean libraries for the whole county. Lawyer called smaller libraries “the icing on the cake” which did not affect the underlying core service. Library closures challenge allowed – Independent – “Judge McKenna, sitting as a deputy High Court judge, told a court packed with campaigners he had concluded that both claims succeeded. He stressed that they had succeeded on “only one of three grounds”. Somerset and Gloucs library closures “unlawful” – BookSeller. “”In order to discharge their respective duties, Gloucester County Council and Somerset County Council should have undertaken a sufficient and thorough information-gathering exercise and then properly analysed the data. In this case I conclude both [councils] failed to comply in that obligation.” says Judge McKenna. Somerset County Council reacts to High Court ruling over libraries – Chard and Ilminster News. Warning as court stops library cuts – Rutland and Stamford Mercury. “The judge declared the decisions were “not merely unlawful decisions, but in substance ‘bad government’, and it is important to the rule of law to give due respect to these issues of equality”. Fight to secure future of Yorkshire drama library – The Stage. “Drama and music groups in Yorkshire are campaigning to save a library service housing more than 90,000 play texts and 500,000 pieces of music that is under threat”. Yorkshire Libraries and Information Music and Drama Service. Council asking for other people to run service, on either a voluntary or commercial basis. Kindle lending experience from a patron’s perspective “a wolf in book’s clothing” – Librarian.net. “while the process to obtain the book wasn’t too difficult, the process to actually get RID of the book once returned [without a lot of pesky “hey maybe you should BUY this” cajoling] was actually fairly difficult. The default settings are, not surprisingly, strongly urging that the patron purchase (not renewal, not some sort of overdue notification) the book that they have just “returned.””. Rethinking libraries? Axiell Symposium – Policy Review TV. Excellent reviews and slides of of conference. The Anythink video and slides in particular show what can be done with investment and strong ideas/leadership. State of seized library – Occupy Wall Street Library. Heartrending pictures of damaged books and computers. ““Many books destroyed. Most equipment -and structures missing. . . most of library is missing (all of the reference section btw), damaged or destroyed.” … ““A lot is destroyed . . . more may (or may not) be coming out of their giant trashpile at back of building.” But it’s obvious to me that by recklessly throwing the contents of the park into dumpsters, the NYPD and DSNY working under Bloomberg’s orders destroyed what we built. And that their claim that the library was “safely stored” was a lie.”. Many books, autographed by their authors, missing. Lawsuit may be filed as property appears to have been seized and damaged without proper legalities, allegedly. Dorset – Campaign group: Charmouth Village Library. Lambeth – West Norwood, Minet, Carnegie, Durning and South Lambeth under threat as future depends on volunteers. Waterloo Library could be relocated, current site sold to developers. Dorset – Charmouth: Library fight will continue say AdLib campaigners – Bridport News. “A highly-charged Dorset County Council meeting saw councillors vote for a second time to take away core funding from nine of the county’s 34 libraries. Campaigners say they will take the issue to the Secretary of State.”… “The vote was split down party lines with 25 Conservative councillors voting against the motion to keep the libraries funded and 14 Lib Dem and Labour councillors voting for it. Three councillors abstained from voting, including Marshwood Vale member Col Geoff Brierley, who is also a member of the Friends of Charmouth Library.” Council says them withdrawing from running the libraries gives villagers “a great opportunity” (sic). Three year support package from council to volunteers, no guarantee of funding after that. Hampshire – Library plans to be looked at again – This is Hampshire. “Hampshire County Council is proposing to close two libraries and slash opening hours at 36 others as part of controversial plans to save £2.4m. But just five weeks into a three-month consultation, library bosses have acknowledged proposed cuts might cause problems in Alresford, Eastleigh, Totton, Whitchurch and Leigh Park but say the total number of hours will still be reduced by eight per cent.”. Council is changing opening hour cuts proposals due to feedback. Relocate Waterloo Library and sell Lower Marsh site, says Commission – London SE1. Small size of library, and need to cut costs, mean it could be sold. Notice at University of St Andrews Library. Waltham Forest – Leytonstone: Community library “can’t use branch’s books” – Guardian series. ” Residents living by Harrow Green Library in Leytonstone are currently in negotiations with the council to set up their own facility in the same building after it shuts on Friday December 2. But they are furious to learn that the council will not let them use the branch’s current stock of books as they had hoped. The authority says the resources will be redistributed and that no decision has been made on whether to let campaigners use the building.” Some items will be provided but exactly what has not yet been finalised. Print article This entry was posted by Ian Anstice on November 16, 2011 at 11:00 am, and is filed under Uncategorized. Follow any responses to this post through RSS 2.0. You can skip to the end and leave a response. Pinging is currently not allowed.